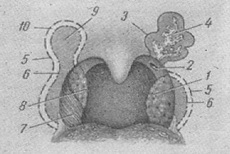 Pharyngeal lymphadenoid Pirogov ring - Waldeyer: 1 - lingual tonsil; 2 - palatal the amygdala; 3 - nasopharyngeal (pharyngeal), the amygdala; 4 - a collection lymphadenoid tissue in pharyngeal the mouths of the auditory tube. Tonsil - significant accumulations lymphadenoid tissue in triangular niches between the front and rear sides of the soft palate (Palatine tonsils), on the back-the upper wall of the nasopharynx (the pharyngeal, or 3rd, amygdala), at the root of the language (speaking, the amygdala). In addition to the tonsils, limfadenopatia tissue scattered in different parts of the mucous membrane of the pharynx, forming together with the tonsils protective barrier called pharyngeal lymphadenoid Pirogov ring - Waldeyer (Fig). The value of the tonsils different - from the size of an almond grain to walnut, on their surface there are numerous holes and pockets, called gaps or crypts. Pharyngeal, or 3, the amygdala in childhood often is in a state of hypertrophy (see Adenoids). The basis of the tonsils is tonkosloinoi connective tissue, which infiltrates a large number of lymphocytes, places forming globular clusters - follicles lighter centres which is the reproduction of cells and neutralization of toxic substances, falling in the mucous membrane of the pharynx. In the study of the tonsils, in addition to viewing them (required under artificial good light), used more probing the gaps of the tonsils and careful squeezing them pathological content that, if necessary, put cytological and microbiological analysis. Pathology. Hypertrophy of the tonsils often combined with Palatine tonsil hypertrophy. Hypertrophic tonsils in children inflammatory changes in the most cases absent. In cases where the hypertrophied Palatine tonsils are some mechanical obstacle for normal breathing, eating, recheobrazovaniya, try to apply restorative treatment (vitamins, climatic treatment), and in case of failure resort to partial destruction of them - tonsillotomy (see). Acute and chronic inflammation of the tonsils - see sore throat, Tonsillitis. Fig. 1. Pharyngeal lymphadenoid ring: 1 - lingual tonsil; 2 - palatal the amygdala; 3 - nasopharyngeal (pharyngeal), the amygdala; 4 - pipe amygdala; 5 - lateral ridges; 6 - scattered lymph follicles in the mucous membrane of the posterior pharyngeal wall. Tonsils (tonsillae, amygdalae - almond walnut) - large aggregations lymphadenoid cloth laid in separate regions of the mucous membrane of the upper respiratory tract. Palatine tonsils (tonsillae palatinae), similar in shape to almonds, located between nebnye bails; in nasopharynx - pharyngeal or nasopharyngeal, M (tonsilla pharyngea; synonym third Meters, or the amygdala of Luchki), at the root of the tongue - speaking Meters (tonsilla lingualis; synonym fourth Meters). Smaller clusters lymphadenoid tissue lie in nasopharyngeal holes auditory tube Eustachian) - tube Meters (tonsillae tubariae); in pyriform sinus at the entrance to the larynx, a false vocal cords and larynx ventricular sometimes guttural M (tonsillae laryngis); in lateral parts of the posterior pharyngeal wall, the so - called side bolsters. All these clusters lymphadenoid tissue form together with scattered in the mucosa of the pharynx individual and group lymph follicles pharyngeal lymphadenoid ring Waldeyer (Fig. 1). This ring is part of one peripheral lymphadrainage (follicular) apparatus, located in the mucous membranes and represent part of the total of the lymphatic system. Anatomy. Palatine tonsils are in the so-called tonsillar niches (sinus tonsillaris) - triangular spaces between nebnye bails and the tongue. Their size varies in the adult: vertical-15-30 mm, front-back - 15-20 mm in cross-12-20 mm Outwards from Meters, between it and the top of the sphincter of the pharynx, lies a layer of loose peritonsillar fiber, continuing up in the soft palate, and down to the base language. 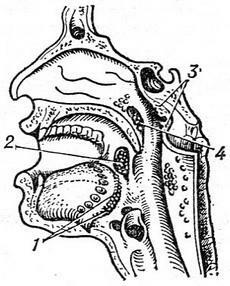 The free surface of the tonsils, addressed to fix, uneven, as if pitted the mouths of many (8-20) blind channels-lacunae (crypts), penetrating thickness Meters and Windows that its free surface of various shapes with holes from 1 to 3-4 mm Gaps can be direct, but more often they winding, branchy and communicate. Sauna surface M. and gaps lined with multi-layer flat epithelium. The outer surface Meters, facing towards the side wall of the pharynx, covered with a layer of dense connective tissue. This pseudocapsule palatal M is part of buccal-pharyngeal fascia. Palatine tonsils can be free and act in the lumen of the throat, sometimes hidden and how they would be disadvantaged in Palatine the arms. Largest Meters can be divided into three degrees: 1) does not extend beyond the edge of the rear palatal arch; 2) more or less beyond the edge of the back arch and the palatal 3) reaching or approaching the median plane. M. sometimes convex, sometimes flat. Can meet a well-developed palatal clove, deep calling to the soft palate, or incremental vnutridnevnaya M deep green lacuna is the sine of Tortues. From the lower part of the front palatal arch leaves variously expressed fold of mucous membrane - triangular fold of GIS, often creates an obstacle for emptying the gaps of this part of the M Anatomical variants - see Fig. 2. Fig. 2. 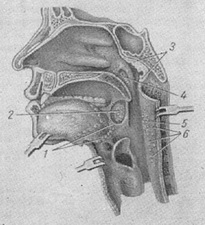 Anatomical variants of the tonsils: 1 - free-serving Zev the amygdala; 2 - mouth incremental tonsils; 3 - additional soft palate, the amygdala; 4 - the sine of Tortues; 5 - muscle wall of the bed tonsils; 6 - pseudocapsule tonsils; 7 - triangular fold of GIS; 8 - the amygdala, aggrieved in the Palatine arches; 9 - a big smile, clove; 10 - sphenopalatine pocket. Fig. 3. The scheme of circulation of the tonsils: 1 - a. carotis ext. ; 2 - a. maxillaris; 3 - a. palatina descendens; 4 - a. pharvngea ascendens; 5 - a. palatina ascendens; 6 - a. facialis; 7-a. lingualis; 8 - a. thyreoidea sup. ; 9 - a. carotis communis; 10 - a. carotis int. Palatine M supplied with blood usually several arterial branches (aa. tonsillares) from the system of the external carotid artery, at least - of the internal carotid artery, as well as from rising palatal, ascending pharyngeal descending soft palate, facial, speaking directly from the external carotid and even at a time of two or three arteries (Fig. 3). Vienna Palatine tonsils accompany arteries pass through the pseudocapsule form plexus on the lateral surface Meters and flow into the pterygoid venous plexus. Leading the lymphatic vessels of the tonsils are not. Discharge lymphatic vessels out on the lateral surface M. and form the front and rear plexus. From last discharge lymphatic vessels go to the front upper band deep cervical lymph nodes, and first of all to the lymph node (sometimes to 2-5), lying at the confluence of the total facial veins in the internal jugular. Innervation of the Palatine M very complex and is trigeminal, glossopharyngeal, wandering, speaking and sympathetic nerves.